Good thing I learned to text, or I might not understand what UP2U meant. I’m technical, but occasionally behind the times, preferring to talk rather than text. This Mentos gum is definitely youthful & fun. The first pack I tried was the Fresh Mint Berry Watermelon mix. When I took the gum out of the cellophane wrapping, I was overcome with aroma (creamy peppermint with some sour fruity character). I knew the flavor was going to be strong. The berry watermelon initial taste was a jammy berry with some floral and melon notes. Quickly, it went to a cool, but sour berry gum with green character. Then there was a minty taste, but with a bad ashy character. Initially, I would say the flavor was “bumpy” switching quickly between intense flavors. At about 1 1/2 minutes into the chew, the flavor adjusted to a more mouth-watering sour melon, seedy strawberry, and mint flavored gum. At about 3 minutes, my throat was overwhelmingly cool. I could easily chew the gum for 15 minutes while experiencing bursts of melon, berry and mint notes. 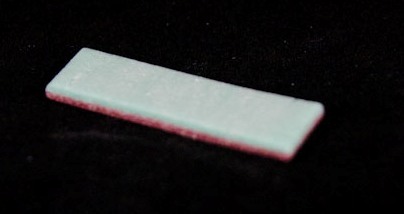 This gum had long-lasting flavor, but I wish this gum was more balanced and sweeter. My first impression of the Fresh mint was melon and bitter. 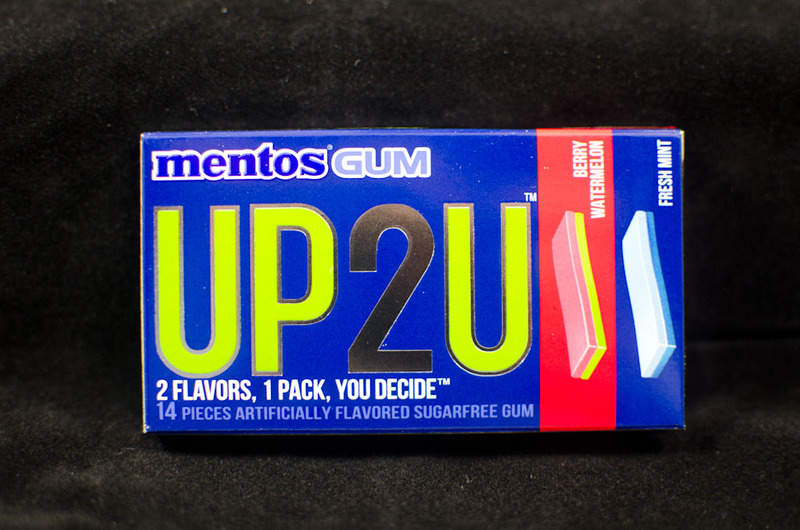 I wanted more sweet minty character in the gum, it seemed too bitter. Several minutes into chewing, coolness hit me on the back of my throat and top of mouth. Initially, I would describe the mint flavor as mentholic (one-dimensional, medicinal with nasal clearing effect), however, after approximately 5 minutes of chewing, the mint oil was recognizable as a mint plant grown commercially in India (Mentha arvensis). Mentha Arvensis can be dirty and harsh and not as sweet as Mentha Piperita (Peppermint oil). The melon/cucumber note lingered the entire chew (approximately 15 minutes), but I found it carried a sweet note that balanced the bitterness of the mint flavor. I had fun chewing this gum and looking at the package. It’s a cleverly marketed gum. 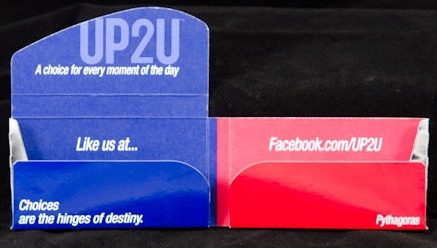 I liked the quote on the inside of the package “choices are the hinges of destiny” Pythagoras and per the package request, decided to “like” UP2U gum on Facebook. It’s good to have choices. Or as the package states “A choice for every moment of the day”.